Discussion in 'General Surgery' started by Egyptian Doctor, Jan 27, 2019. A Chinese surgeon has been hailed as a hero after working about 20 hours non-stop to save urgent patients. 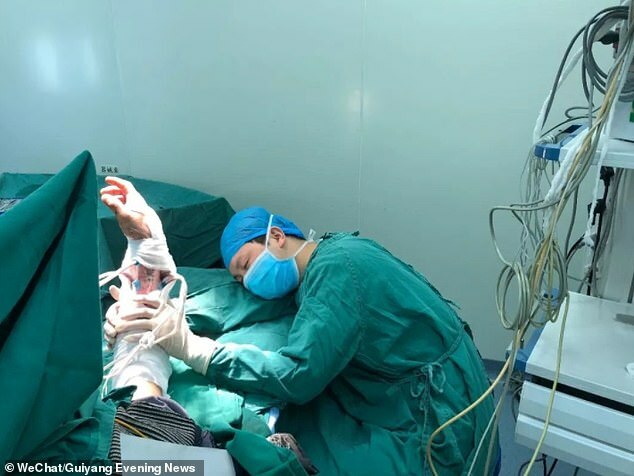 A poignant picture shows orthopedic surgeon Luo Shanpeng falling asleep by the operating table after re-attaching the severed arm for a migrant worker. He was sleeping while squatting down by the table, still holding the arm he had just re-attached for the patient. He had performed five operations and his sixth surgery lasted for eight hours. 'Seeing this makes my heart ache,' said the nurse who took the picture of her colleague out of respect. The picture has gone viral after appearing on WeChat, a Chinese messaging platform. Luo works for the No. 6 People's Hospital of Guiyang in south-eastern China's Guizhou Province. He told Guiyang Evening News that he had already performed five operations when a patient was rushed into the hospital at around 6pm on January 3. The patient's right arm had been mangled in a meat mincer and nearly torn off from his body. Luo decided to carry out emergency surgery for the patient despite the fact that he had already worked over time. The picture was taken at around 4am the next day. He told the local newspaper that he had worked nearly 20 hours without a break by then. He held the patient's arm because the patient was still undergoing general anesthesia, and the arm couldn't touch anything until the cast on it dries up. Therefore, he held the arm for the patient. This also kept the blood circulating in the arm for the patient. Speaking to video platform Pear, Luo said though he was tired at the time, he agreed to perform the surgery as he felt he could still concentrate. He said as a surgeon it was important for him to keep his body healthy and his mind clear. Luo added that it was an honour to become a surgeon and the happiest thing for him was to see his patients recovering.